Photo of the Week. 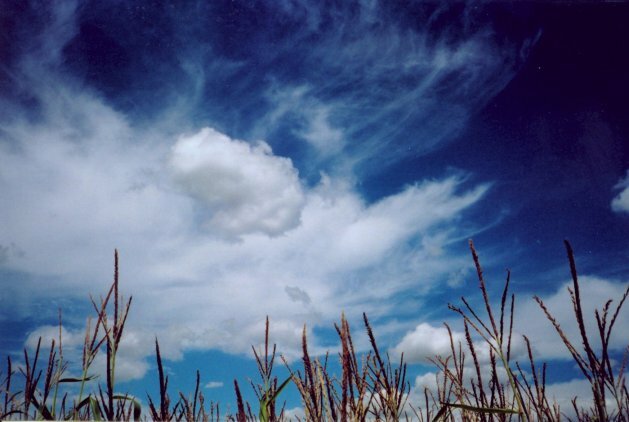 Blue sky with corn. Astronomy news for the week starting Friday, November 30, 2001. The beginning of the week sees the Moon at full phase, which is reached shortly before moonrise the night of Friday, November 30, in North America. That night the Moon will therefore rise in twilight just after sundown. Since the Sun is now not far from the winter solstice in Sagittarius, the oppositely-positioned full Moon will be just shy of the summer solstice in Gemini, and will therefore be moving against the stars of Taurus, where we now find Saturn. The result will be a special treat, an occultation of the ringed planet in which the Moon will appear to pass across it. The occultation will be observable shortly after Moonrise through most of the US and Canada, with the northwest unfortunately left out, the Moon hiding Saturn for about an hour. Binoculars will help. Begin looking shortly after 6 PM Central Time. For the remainder of the evening, the near-full Moon will appear just to the east of Saturn. The night of Sunday, December 2, the Moon will then be just to the west of Jupiter in Gemini, the night of Monday the 3rd, just to the east of it. That the Moon is covering Saturn when it is close to full phase means that Saturn is also opposite the Sun, and sure enough, the planet passes through formal opposition to the Sun on Monday, Dec. 3. That night it will rise at sunset, set at sunrise, and cross the meridian high to the south at midnight. The planet is now glorious in a telescope, its rings nearly fully "open," that is, tilted toward us to greatest advantage. Even a small telescope quickly reveals Titan, Saturn's largest moon, which is roughly the size of the planet Mercury, as a satellite second in size only to Jupiter's Ganymede, and the only satellite with a thick atmosphere. The tag ends of the planetary system rendezvous with the Sun, at least from the perspective of Earth. Mercury passes through superior conjunction with the Sun on Tuesday, December 4, while Pluto is in conjunction on Thursday, the 6th. Of course that is only a line-of-sight coincidence. In reality, Mercury will be 40 million miles (nearly 70 million kilometers) the other side of the Sun, while Pluto will be an astounding 2.8 billion miles (4.5 billion kilometers) to the other side. Pluto is so far away that if you were to try a telephone conversation with a pretend astronaut (a very brave one we might add), it would take nearly four and a half hours for the radio signal -- moving at the speed of light -- just to get there. Then you would have another 4.4 hours to wait for an answer. The remaining outer planets, Uranus and Neptune, still both reside in Capricornus, which is now seen in the southwest in early evening and near invisible in bright moonlight. While Jupiter takes 12 years to pass through the constellations of the Zodiac and Saturn 29.5 years, these two respectively take 84 and 165 years, and linger within their current constellations of residence for a considerable time.